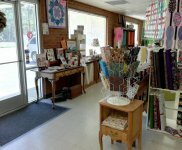 April 20-21 is Barefoot Sale Weekend! All of our Barefoot Club members will receive 20% off of their total purchases tomorrow and Saturday! 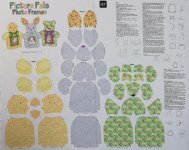 (Quilting, classes and shop kits excluded.) 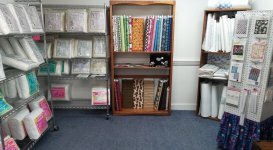 Stock up on your wide backs, batting, basics, precuts, pins, needles, rulers, books, patterns and more! It's easy to join the Barefoot Club (and no, you don't have to be barefoot!). Just a one-time $15 membership fee is all it takes and you're all set! 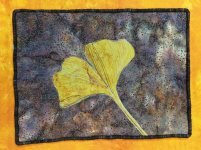 Then, on the third Friday-Saturday of each month you'll receive the Barefoot discount on your purchases! Well, spring has finally arrived and with it we decided to freshen up a bit. Soooo....we have rearranged a few things (again!). Come visit and tell us what you think! 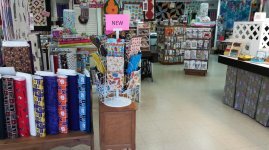 We've opened up the front of the shop so you can see what's new as soon as you walk in. There's also more space when you're ready to check out. 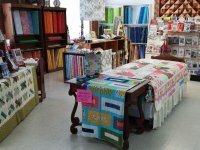 We moved the bed out into the shop to display our beautiful quilts for sale. 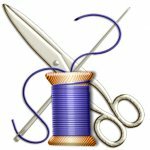 The Sweet Union Guild - the new Union County quilt guild - will meet tomorrow, April 20 at 7:00 pm at the Monroe Fire Station, 3903 Old Charlotte Hwy, Monroe, 28110. 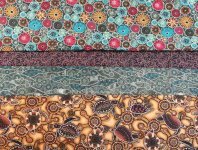 Down Under Aboriginal prints from newcomer Oasis Fabrics - You asked and we delivered! 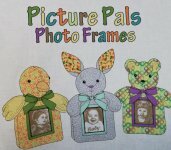 Picture Pals Photo Frames from Quilting Treasures - Put a photo of yourself in a plush pal so your little ones can keep you close when you're far away. 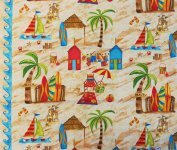 Shore Thing, from Blank Quilting - Just in time for the summer! 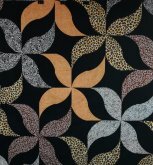 Catnip, from Gingiber for MODA - This classic, monochromatic color scheme looks good with any decor! 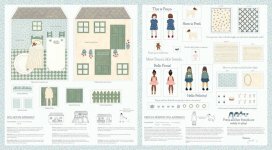 Freya and Friends digital dollhouse panel from Janet Clare for MODA. Collegiate prints are in season! 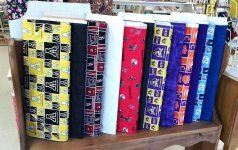 Make a quilt and pillowcase for your high school grad to take to college. 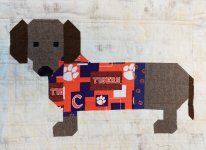 - and made this adorable version for a college bound friend! Thank you Margaret Proctor, for sharing this cute and clever idea! QuiltSmart printed interfacing makes this Cell Phone Clutch a breeze! 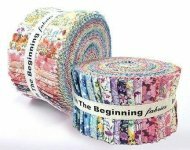 Sweet Rolls - This pattern would be amazing the soft floral prints of Garden Delights! 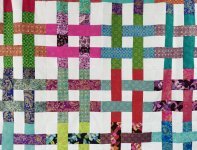 Coconut Strips - Fat quarter friendly or a great stash busting pattern. 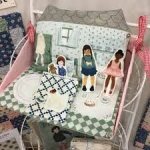 Square Dance - Perfect for those 5 inch squares! 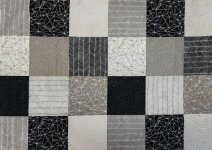 Due to popular demand we have added another class date for this gorgeous modern quilt.